Stanley Michael Bailey Hailwood, MBE, GM (2 April 1940 – 23 March 1981) was a British Grand Prix motorcycle road racer regarded by many as one of the greatest racers of all time. He was known as "Mike The Bike" because of his natural riding ability. Later in his career he went on to compete in Formula One auto racing, becoming one of the few men to compete at the Grand Prix level on motorcycles and in auto racing. 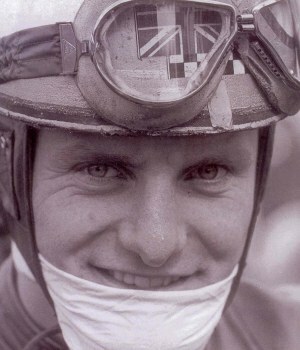 Mike Hailwood was born at Langsmeade House, Great Milton in Oxfordshire, His father, who also raced in the pre-World War II era, was a successful motorcycle dealer and as such, Hailwood had a comfortable upbringing. He learned to ride at a young age on a minibike as a small boy in a field near his home. He was educated at Pangbourne College, but left early and worked for a short time in the family business before his father sent him to work at Triumph motorcycles. He married Pauline Barbara Nash on 11 June 1975 and had a son and a daughter. After turning to car racing with satisfactory results, Mike the Bike made occasional appearances in motorcycle races in 1971 and in brilliant TT (Winning!) exploits of 1978 and 1979 aboard the Ducati Twin and Yamaha in the Senior TT. As a mocking sign of fate, he died in an ordinary road accident (in a Rover 3500) together with his young daughter Michelle on 22 March 1981... his son survived. This page was last edited on 21 January 2011, at 03:31.